Cyber Car is a car that is equipped with Internet access, and usually also with a wireless local area network. This allows the car to share internet access with other devices both inside as well as outside the vehicle. Often, the car is also outfitted with special technologies that tap into the internet or wireless LAN and provide additional benefits to the driver. Examples include: automatic notification of crashes, notification of speeding and safety alerts. These cars usually have a head-unit, in car entertainment unit, in-dash system with a screen from which the operations of the connections can be seen or managed by the driver. Types of functions that can be made include music/audio playing, smartphone apps, navigation, roadside assistance, voice commands, contextual help/offers, parking apps, engine controls and car diagnosis. Real-time monitoring of the vehicle’s status and operation. Savings, through being able to detect potential problems with the car early on. Tracking of the vehicle in the event of car-jacking and alerts to safeguard the driver and relatives. Remote control of the vehicle in countries where this is allowed by law. Optimization of routes and driving expenses. Monitoring and remote diagnosis of the vehicle. Software updating with the possibility of changing the car’s configuration remotely. Mobile phones or tablets can be used to control HVAC systems as well as other operational systems, suspension, etc. on the vehicle. Safety systems and automatic emergency calls in the event of an accident.Maps, real-time traffic information and satellite imaging. Real-time information about fuel prices and the location of the nearest service stations. Access the Internet, instant messaging, e?mail, social media. Streaming radio and other music services. Videos and other entertainment apps for passengers. Information and geo-location of nearby points of interest. Emergency services: GM's On-star platform connects the car automatically to an emergency service in case the passenger or driver does not respond in case of an emergency. Vehicles of the future are expected to sense and "see" things, communicate through the cloud, talk to other vehicles, and pick up information from those vehicles. You will know there are power lines down over the road, or that there are children playing on the road up ahead, because vehicles will sense that information and will pass it on to other vehicles, thus making it safer all around. Vehicles will also know the condition of the vehicles around them; they will know if there is a problem emerging and will transmit this information to other vehicles. For example, a large semi-truck that is driving alongside you is about to break down. Since your vehicle is in contact with the truck, you will feel safer knowing what's going on. This technology can be used in school buses and delivery vehicles. This can help parents know the exact location of their child's school bus, how fast it's traveling and when it will reach home. It can provide lane departure warnings to drivers. With so many features and constant back and forth with the car, driver distraction increases. Due to increased connectivity, opportunities for hackers, criminals or governments to spy on drivers increases. The risks of systems being hacked in ways that may cause auto malfunctions and/or accidents. As we have seen, cyber car has many pros as well as cons. 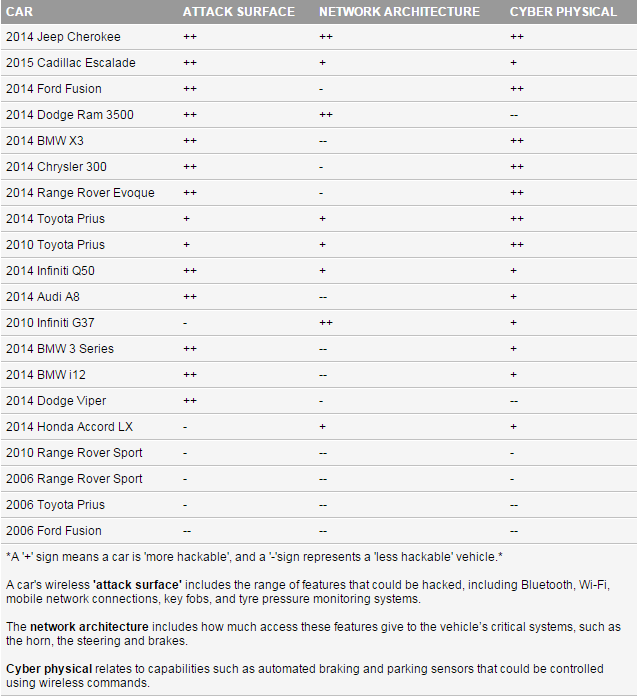 Deeper research into security cyber security of cars will make sure that cons are minimized and the pros outweigh cons once the technology reaches a mature state.